Buried way down on page 102 of the December 1992 edition of Black Enterprise magazine is an article titled The Power Of Investing In What You Know. It starts by listing some of the greatest consumer products of the past century – think Coca-Cola Classic, Heinz Ketchup and Kellogg’s Corn Flakes – before discussing the merits of investing in well known consumer companies. The piece then goes on to name a dozen stocks that might make a good portfolio. Included are some of the best investments of the past few decades. Disney, McDonald’s, Nike and PepsiCo are the ones that jump out straight away. I mean you know before running numbers that these four alone would have made you seriously wealthy. Other names on there include Gap and Mattel; both of which are still chugging along as independent companies. Paramount Pictures made the list but was acquired by Viacom in 1994. Food company Quaker Oats, which was purchased by PepsiCo in 2001, is also on there. The other four are Toys ‘R’ Us, Stride Rite, Sara Lee Corporation and Rubbermaid. Imagine for a moment that you picked up that edition of Black Enterprise. You liked the idea of a ‘buy what you know’ strategy so much that you decided to invest in the companies listed in the article. Let’s say you stumped up $120,000 in total, divided equally among the twelve stocks. How would that have worked over the next twenty-six years? As it happens it did pretty well. Take McDonald’s for example, which made the list at $46 per share. In the years that followed the company split its stock twice, each time creating two new shares for every original one. Adjusting for these splits gives us an initial share price of around $11.50 in today’s terms. With $10,000 you were able to purchase 870 of these split adjusted shares. These days McDonald’s shares are changing hands for around $160 each. In addition they have also pumped out a small fortune in dividend payments over that period (roughly $35 per share to be more precise). In total, and this assumes the cash dividends just piled up in a checking account somewhere, that position would have returned just under $170,000 at the time of writing. What about some of the other big name tickers in that portfolio? Well, Disney stock has also done pretty well over that time. When the article first went to print Disney shares were changing hands for around $12 apiece after adjusting for subsequent stock splits. You would have been able to purchase around 835 shares back in late-1992. Today Disney stock trades at around $110 per share. It has paid out around $10 per share in cumulative dividend distributions in the intervening period. 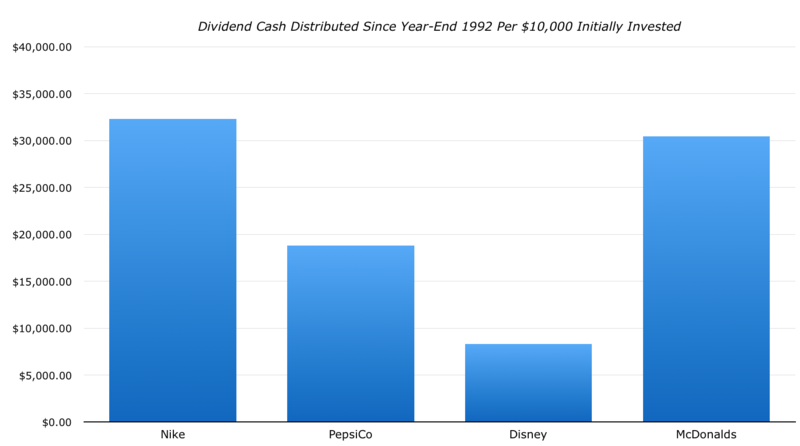 Your total return on Disney stock would be around $100,000. Next up we have Nike and PepsiCo. Let’s start with the former, which in December of 1992 was trading at $55 per share. Nike has split its stock five times since then – in 1995, 1996, 2007, 2012 and 2015 – with each split resulting in two new shares for each original one. Adjusting for these splits means that your initial share price was just $1.70. That would have netted your around 5,880 shares. Today Nike trades at around $77 per share. It has also paid out around $5.50 per share in cumulative dividend payments, making the total return on that position nearly $500,000 as I write. What about PepsiCo? Well, you picked up the stock at the end of 1992 for $17 in split adjusted terms. Today it trades at around $115. In addition you got around $32 per share in cumulative dividend payments. The total return works out to $85,000. PepsiCo has done some other things during that time as well. For instance in late-1997 it spun off its restaurant assets – which included KFC and Taco Bell – into a company now called Yum! Brands. You got one share in this new company for every ten shares of PepsiCo common stock owned in 1997. Now, since 1997 Yum! Brands stock has compounded away at a rate of around 15% per annum. If my math is correct then that position would be worth around $21,500 to you right now. Not all of the picks turned out as winners. Mattel stock, for instance, has had a pretty tough time. Indeed it has barely beaten inflation over our twenty-six year time frame. Toys ‘R’ Us didn’t do so good either. It made the list in 1992 at $34 per share. Thirteen years later the company was acquired in a leveraged buyout for around $26.75 per share. That said there are two things I like most about this case study. Firstly, another example that the consumer space is relatively stodgy. Of the twelve stocks listed I think only Toys ‘R’ Us has gone completely bust, and even in that case you would have salvaged something due to the 2005 takeover. Secondly, big winners can more than make up for big losers. I mean even the position in PepsiCo – which was still a very stodgy blue chip stock back in 1992 – was a ten-bagger after taking into account the Yum! Brands spin-off. As I concluded at the end of the last piece: some food for thought next time you’re tempted to dump a stock because it had a poor quarter.